7 Best Places to Travel in Thailand on a Budget & Like a Boss! 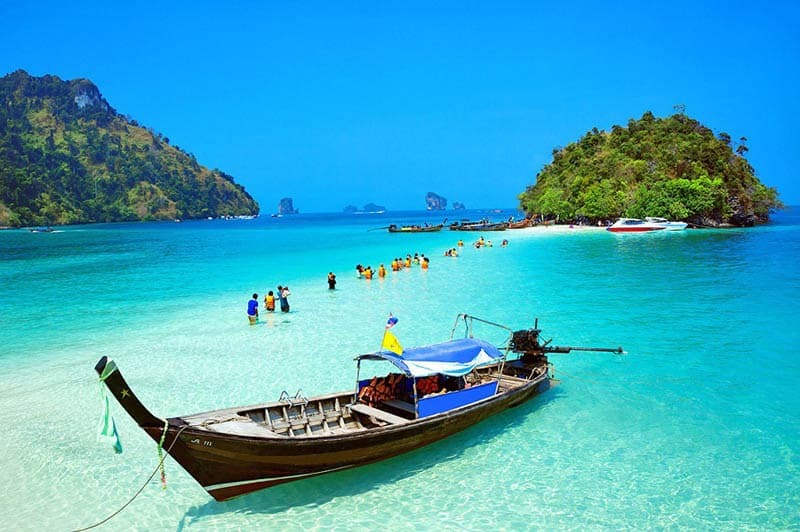 Thailand is one of the most fun and exciting destinations nearby for Indians looking to travel for a holiday abroad. Thailand can be as expensive or inexpensive as you make it to be. You can find rooms ranging from Rs 200 for one whole day to Rs 60,000! Eat low-cost food from roadside eateries or gourmet meals for 1000s of rupees. The choice is all yours. However, if you are on a budget and still want to have a good time in Thailand, then this blog post is for you. Find out the 7 best places to travel in Thailand on a budget and like a boss! Bangkok is probably where you are going to land, at Suvarnabhumi international airport. 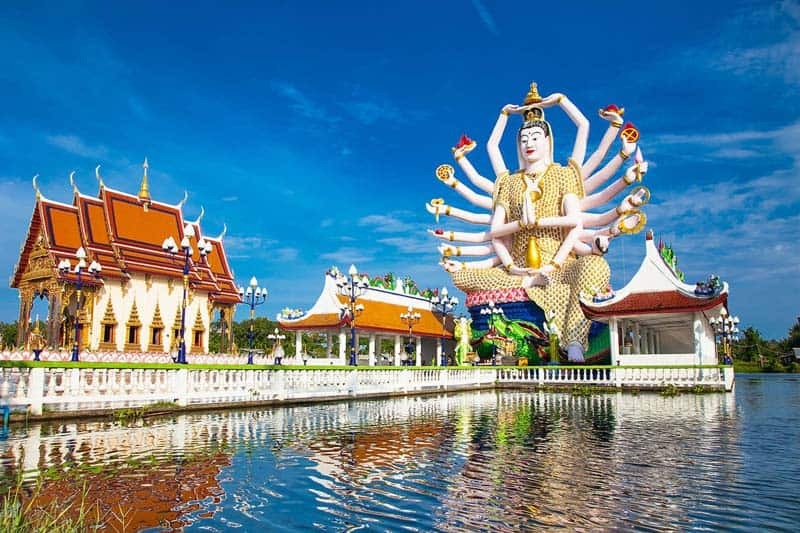 So you can begin your Thai trip right from its capital city. The hotel stay is going to be the costliest part of being in Bangkok. Couchsurfing is a huge hit in the city (We have written more about Couchsurfing in this blog post : Easy tips to save money when travelling abroad). Grab the chance to bunk with a local free of cost and make a Thai friend while staying there. 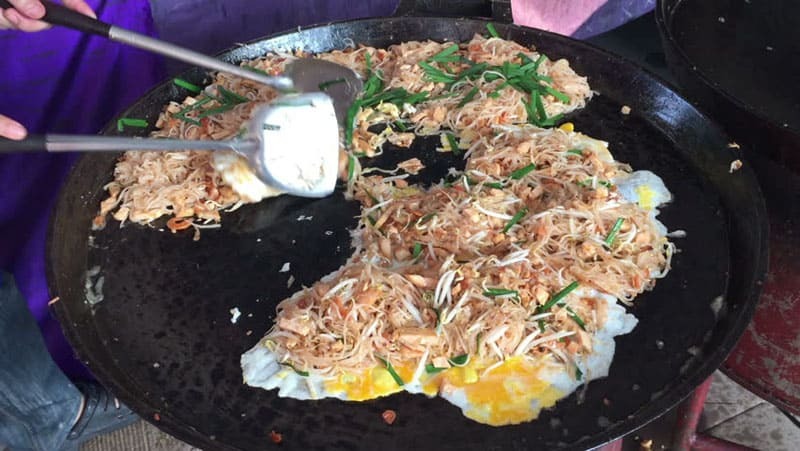 Also, regarding eating, try the street food offered in Bangkok. Tasty and delicious pad thai noodles in a bowl will offset you by $1 at most in roadside eateries. Kanchanaburi near the Myanmar border is the perfect getaway destination after the hustle and bustle of Bangkok. It’s a good place to relax and spend time while avoiding high costs of staying and eating in a big city. History and nature lovers will especially love Kanchanaburi as the region has plenty of both. 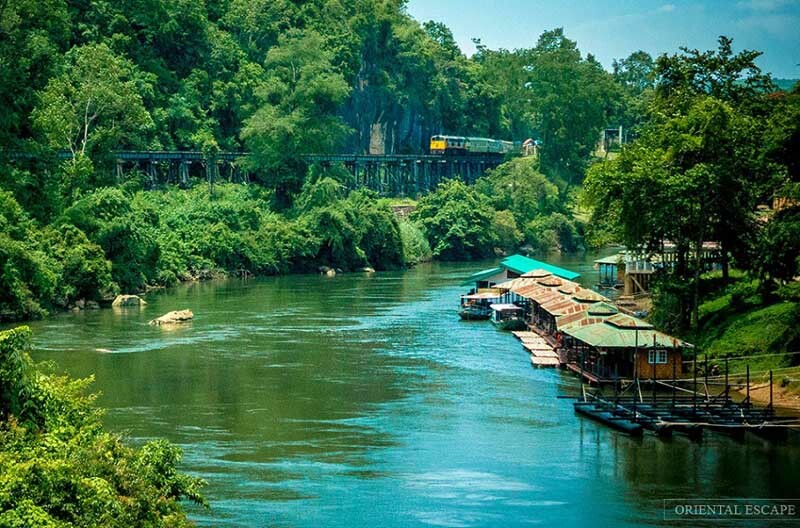 “The Bridge over the River Kwai” or the “Death Railway” built by POWs during World War II is perhaps the most historic attraction in Kanchanaburi. To avoid costs use the public water filter for refilling water at 1 THB compared to 10 THB for buying a mineral water bottle. Budget in Kanchanaburi : $5 to $10 per day. Koh Samui is an island in the eastern seaboard of Thailand. It’s a budget-friendly place for travellers going to Thailand. Most of the major travel spots and natural attractions in Koh Samui can be visited for free without spending any money. Namuang waterfalls, Samui Big Buddha and Wat Plai Laem temple in the picture above are some of the landmarks there. Also, there are 24 beautiful beaches on the island to fulfill your love for sand and sea. Koh Phangan is another island destination you must visit. It’s quite close to Koh Samui and is one of the most famous party destinations in Thailand. 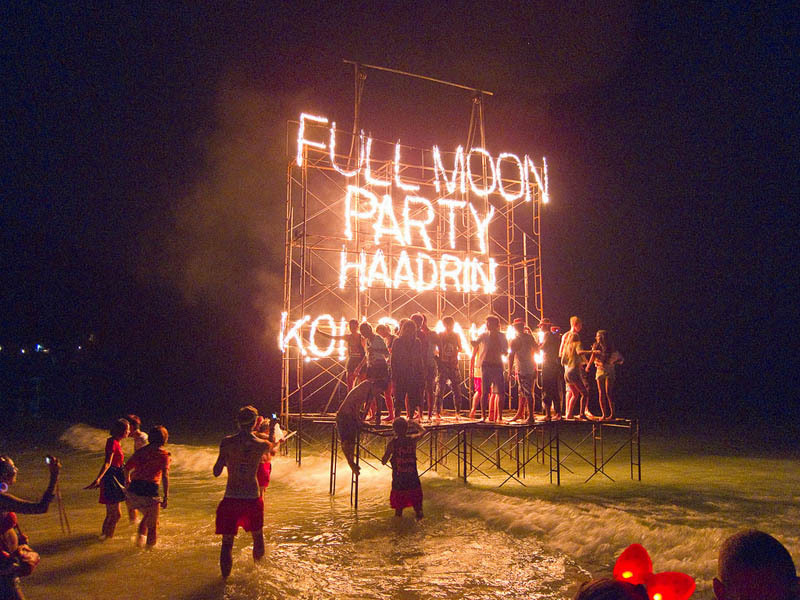 Every month on full moon evenings, there is a party held at Haad Rin with a rave mix of travellers coming together to have some fun! Eat cheap and fresh seafood by visiting the night markets. Buy beers at low prices at about 25 THB (around Rs 53 at today’s Thai baht exchange rate in India) by visiting the local 7-Eleven. Go there a week before the party starts to grab rooms at low prices. 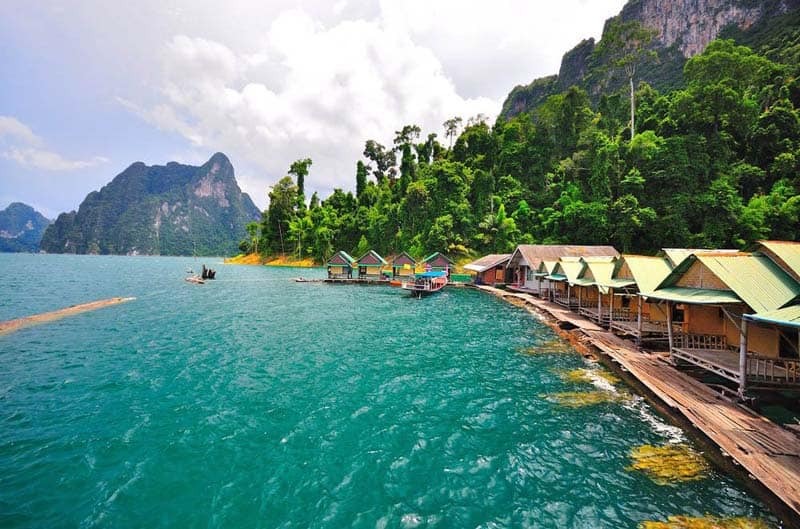 Khao Sok National Park is 739 square kilometre of unspoiled wilderness of which nearly ¼th is the turquoise blue Cheow Lan Lake. Though the national park is considered to be on the slightly more expensive side, a traveller can still cover it within their budget. There are many tour shops on the road to the entrance of the national park where you’d be able to buy tour packages with lots of activities for a cheap price. You can expect a canoe trip on River Sok, cave exploring, staying in the raft houses in Cheow lake etc. The cost would go up if you are planning on doing these activities by yourself rather than as part of a tour group. You might recognize Krabi as the place where Hrithik Roshan and Amisha Patel from the popular Bollywood movie “Kaho Na Pyaar Hai” get stranded on a lonely island. Filled with incredibly beautiful sights like white sandy beaches, crystal clear waters and towering limestone structures jutting from the sea, Krabi is a treat to the eyes. While island hopping is a favourite thing to do here among tourists, it’s kind of overrated. 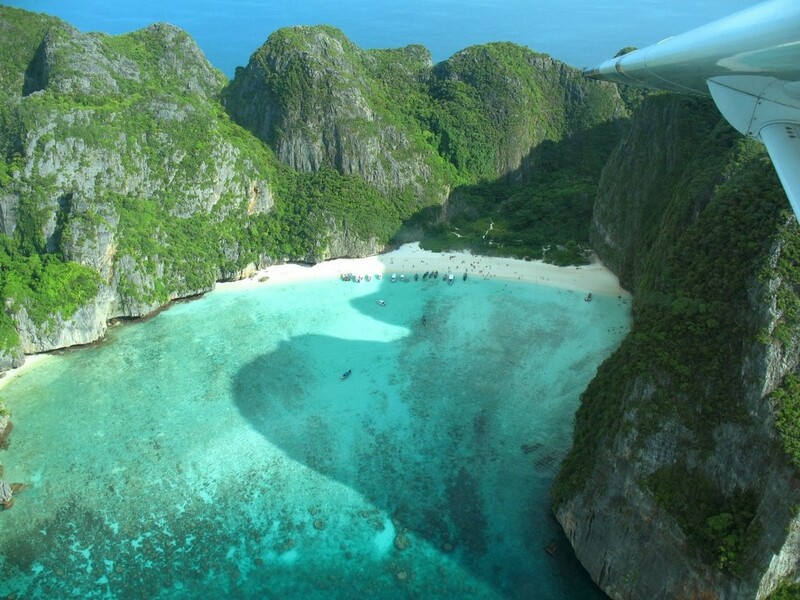 Instead, head to Ao Nang town for an amazing beach destination. From there take a boat for $6 to Tonsai Bay a quiet and serene spot for travel lovers instead of the more famous Railay Bay. Accommodations in Krabi can be found for as cheap as THB 150. We recommend you to find a stay at Ao Nang which is the hub from where all major attractions in Krabi can be easily accessed. Among the places mentioned in this list here, Phuket is the one tending to be more expensive. However, this beautiful Island in the Andaman seas can be done cheaply by simply doing the following things. Travel by Songthaew (local bus) from Phuket to nearby beaches and other attraction at just THB 30. 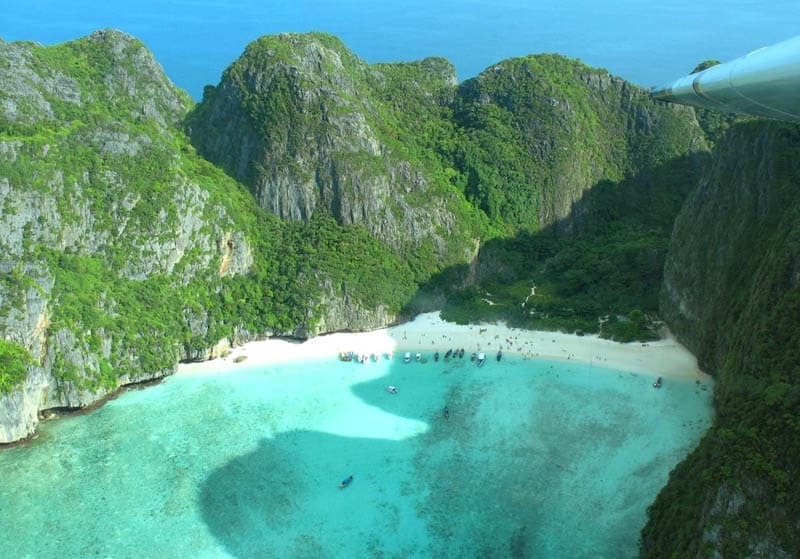 Going during the low season (June), you can easily wrap up a trip to Phi Phi island and Maya Bay (The location for the movie “The Beach” starring Leonardo Dicaprio) for THB 600 including food and drinks. Phuket has an awesome street food culture with fresh seafood meals available for as cheap as THB 25-50. Also, instead of going on diving tours, buy a snorkel and a mask available cheaply at Phuket night markets. Choose from among the more than 36 beaches in Phuket and hit the beach with your snorkelling gear for a fun-filled day of swimming in clear blue waters. Forex – Before going from India to Thailand, plan your budget according to how long you are going to stay there. Convert this money to Thai Baht by carrying 70% of it in Forex card and the rest 30% as currency. You can compare and buy Thai Baht online at the best rates in your town/city here. Save money on currency exchange this way. 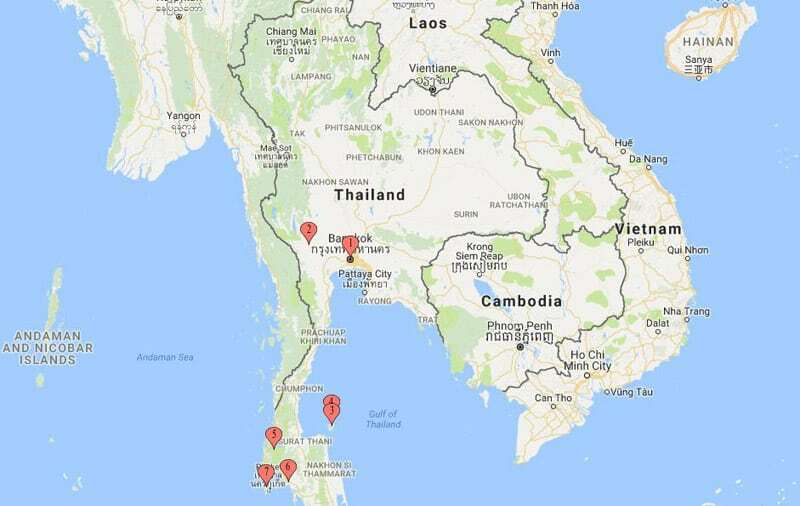 Free Stay – If you are low on money, there is another hack regarding a free stay in Thailand apart from Couchsurfing. Stay for free at a Buddhist monastery in Thailand by just following their rules. Buddhist temples are a place for people to come and meditate. Usually, free food would also be available there.